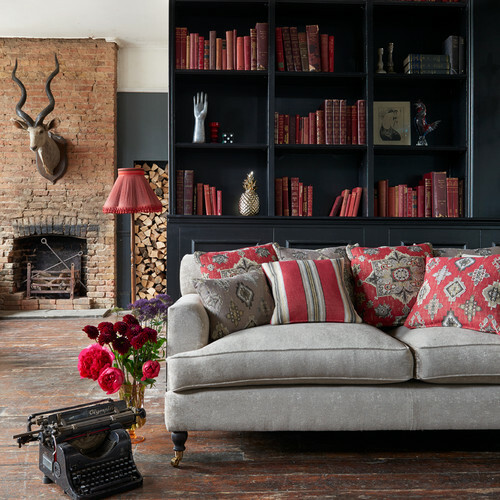 Adding touches of red to a cottage living room can be an inspired decorating move, but can also daunt those who think that the color necessarily invokes boldness. Soft reds are a compromise for those wanting to inject some warmth but who are also afraid of creating an overpowering palette. And Valentine’s Day is a perfect time to experiment with red with the possibility of it becoming a staple in your decor year-round. Red accessories can ramp up your color scheme as much or as little as you desire without any permanent commitment. In the cottage room above, pillows and a lampshade in persimmon both draw out the natural color in the brick hearth and floor and add interest to the neutral taupe couch. Even the spines of old brick red volumes stand out nicely against the black backdrop of a floor-to-ceiling built-in, and can be changed out to another color or object without much energy. Adding red is a great way to easily change up your decor and express your current mood. Do you prefer bright lipstick red or soft berry reds?